I haven’t answered a good question in a while, so here we go. Q: We are looking to be in a new home by the end of the year. Lease is about 4K to get out of early, so not really an option. When should we be pre-approved by and when should we start looking at houses? A: This is a great question where there isn’t a clear answer for everyone. That’s because it depends on what type of home you are looking to purchase and the market for similar homes. For example, if you wanted to buy new construction by the end of the year, it could be too late. That’s because it is taking 8+ months to bridge the gap between pouring the foundation and closing day. So trying to find a new home in less time can really narrow down your choices. 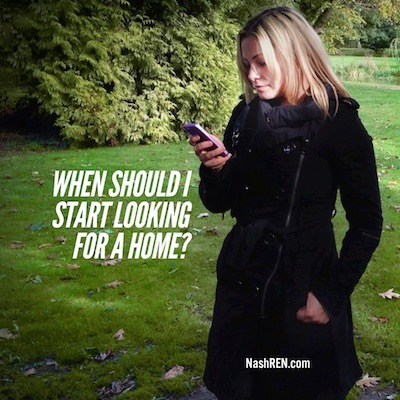 Or you might be trying to find a home in the most popular price range and location. This is a tougher fish to fry because of the level of competition. It’s common to find multiple offers on homes like this where people are paying well over the list price. In this case, it might be cheaper to buy now and pay the $4,000 penalty then wait until the end of the year. Since the beginning of 2017, the median price in the Greater Nashville Area has increased $26,743. The first part of that question, the pre-approval, is easier to answer. I would contact a lender (or several) when I first started thinking about buying a home. I would want to find two things first: a lender that you trust and the lending options available to you. Then just before you start looking at homes, I would contact them again to go through the pre-approval process. This part takes a little time on your end and is necessary to submitting an offer in this environment. A bonus would be working with a company that does a full approval on the front end. This makes buying a home easier and puts you in a stronger position to purchase. If you have the same question about when to start, then hit reply and let me know where you stand. I’ll give you the best advice and options based on your unique situation. This way you can decide what’s best for you. The Daily Deal in Nashville is a mid-century brick ranch home in Whispering Hills that is listed for less than $250,000.